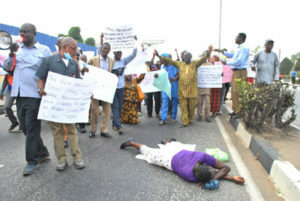 A member of Aviation Unions Grand Alliance (AUGA) fainted during the Peaceful rally over the refusal by the Ministry of Finance to pay the entitlement of ex-workers/pensioners of Nigeria Airways that was approved eight months ago by the Federal Government in Lagos recently. “The governor said the former President should allow him to run Nigeria Airways for one year without collecting any money from the government but Obasanjo insisted that he had made up his mind to liquidate the company’’. “I am happy because, with the part of my entitlement that has been paid now, I can take care of myself, feed my family and send my children back to school,’’ he said.